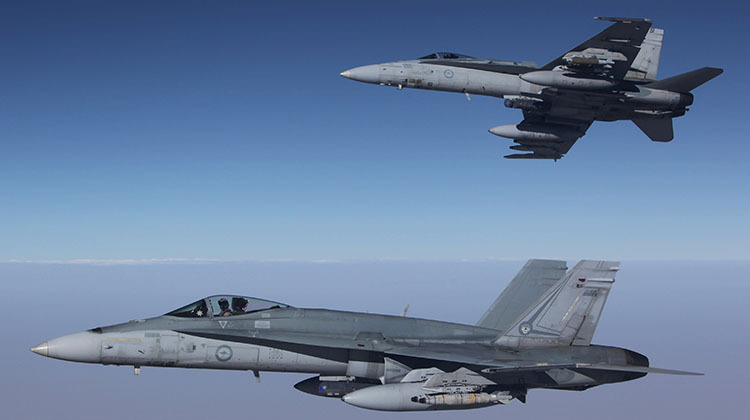 Canada has formally expressed its interest in acquiring soon-to-retired Royal Australian Air Force F/A-18 ‘classic’ Hornets as it explores options to supplement its ageing CF-18 fleet. According to a statement from Public Services and Procurement Canada dated October 9, Canada entered discussions with the Australian Government in late August to assess the potential purchase of Hornet aircraft and associated parts as the RAAF looks to retire the type from late next year. Canada submitted an expression of interest (EOI) on September 29 that formally registered its interest in the aircraft. “Canada expects to receive a response by the end of this year that will provide details regarding the availability and cost of the aircraft and associated parts that Canada is considering,” the statement read. “Until an open and transparent competition can be completed to replace Canada’s legacy CF-18 fleet, Canada is exploring options to supplement the current CF-18 fleet and address an existing fighter capability gap,” the statement said. Canada had been considering a purchase of Boeing Super Hornets to address that fighter capability gap, and the possible sale to Canada of 10 F/A-18E and eight F/A-18F Super Hornets was approved by the US Department of State, the Defense Security Cooperation Agency stated on September 12. However, the Public Services and Procurement Canada statement declared that while the Canadian government is continuing to engage with the US government as it looks at “all options moving forward”, discussions with Boeing relating to the interim Super Hornet purchase “remain suspended”. That follows a complaint by Boeing to the US International Trade Commission that Canada’s Bombardier sells its CSeries airliner at unfairly low prices due to receiving Canadian federal and provincial government subsidies. Both the International Trade Commission and the US Department of Commerce have recommended that tariffs be applied to the sale of CSeries aircraft in the US. Delta Airlines has ordered up to 125 CSeries aircraft. Our Canadian cousins have a real dilemma with their politicians. They just won`t commit to updating and modernising, Instead they are going to look at buying aircraft approaching retirement to keep their fleet of aircraft that should be retiring also flying. Remember the Canadian fleet is older than ours by around two years. Oh Canada!!!!!!!!!! Canada has not been threatened by another country. The country with the largest military has. This is what happens when politicians make promises about defence purchases during an election campaign, get elected and then find themselves in a mess. Think back to recent times in Australia during the 2007 election campaign where Labor identified the F18F purchase should be cancelled but would be reviewed if they won office. After their ‘review’, the deal went ahead. As for Canada and their decision to cancel the F35 and go for an open selection process, they are extremely lucky Lockheed Martin didn’t cancel all the contracts held by Canadian companies to build parts for the F35. Contracts that only came to fruition because of their decision to purchase. In Canada’s defence, they have no real need to upgrade their fleet. They’re doing a couple runs in the Middle East but that’s about it. No real need to upgrade everything. They should have been flying CF-35s by now not looking at buying airframes that are on the edge of being obsolete. There’s very limited options out there that have the same potential as the 35, maybe only the Tiffy II or the Rafael. Still, a very premature and irrational decision. If this is taken up, I think it is far more palatable to Canadians generally, as they can ‘buy time’ to now undertake an open and formal selection process for their ultimate fast jet replacement, including the F-35. From the Australian side, whilst there may be some G2G wrangling, it would be great to know that at least some of our FA-18s will find a welcoming home and the AUS tax-payer sees some return on their sale, offsetting some of the recent Defence spending. Your comment about Canada is spot on, their Politicians have a lot to answer for, and their Defence procurement practices even make India look good too!! Unlike here in Oz, where for the most part, Defence is pretty much bipartisan (about the only thing they generally agree on), in Canada it is the complete opposite. The previous Canadian Government should have made a decision, but didn’t, the current Government said that they would never procure the F-35 (it is a big political football in Canada). They then came up with the plan to purchase 18 Super Hornets as an “interim” solution (again pass the buck for the next Government to make a final decision), that has all fallen in a heap due to the trade dispute started by Boeing over the subsidies for the C Series commercial aircraft. So now it is Plan B for the interim solution, procure some of our soon to retire Classic Hornet fleet (and again push the final decision way off into the future!!). It’s all got rather silly to say the least!! What I would like to see happen (but it wont), is for the US to block the sale of our ‘pre loved’ Classic fleet to Canada (we can’t just sell US equipment to anyone, it has to pass, whatever US FMS and ITAR restrictions where put on the aircraft when we first purchased them). It is not entirely Canada’s fault: Boeing challenged Bombardier’s aircraft sales in the US on anti-competitive grounds and thus suddenly Canada suspended talks with Boeing buying the Super Hornets. Boeing doesn’t have an aircraft in competition with Bombardier and Boeing, arguably, also receives government funding assistance just like Bombardier. Boeing shot itself in the foot. So now Canada is going to look at European fighters in the coming years. The issue is that Boeing is trying to discredit (and cost) Canada over Bombadier so why should Canada deal more with Boeing at this stage. Why not buy from Australia while they do a deal with Europe. Canada’s procurement system makes ours look phenomenaly good, it’s a basket case. The program to replace their Sea King Helos is a perfect example of how not to do it. Instead of buying Merlins or Sea Hawks they decide to re-invent the wheel and turn the Sikorsky S-92 into a Maritime Helo. Since this program started Australia has gone through one batch of Sea Hawks and are now operating their replacements and the S-92s still haven’t achieved FOC. Canada has had a major falling out with one of the Worlds biggest defence manufacturers in Boeing, so any chance of getting Super Hornets or Poseidons is out the door. Wonder how the Americans are feeling about this decision given Canada’s requirment to maintain 2 Fighter squadrons to the AD of North America under the NORAD setup. Sooner or later the Canadian PM is going to get raked over the coals by the White House. The Canadians have a terrible record when it comes to defence procurement. Their navy is a shadow of what it once was and now they are wanting to buy Australian fighters that are 30 years old. Like New Zealand is to Australia, Canada has a parasitic view of defence with America, why should we spend on defence when we have a big rich country that will defend us? It will come back to bite them. I wonder how many hornets they are looking to buy? This would have an effect on our airforce in terms of a fighter gap. I am pretty sure they will get the F-35 , and if not they will buy European. Get your act together Canada.!!! Lechuga – It is important to remember that Canada / RCAF has major responsibilities for patrolling and interception under NORAD in North America and NATO in Europe. Their CF-18s are therefore on a significant continuous service rotation with added fatigue. Adding-in RAAF FA-18s into that airframe pool will extend the remaining service life of their whole fleet, with only minor modifications, and no retraining. John N – Whilst I agree with most of your comment, I disagree with your last ‘preference’: it would be foolish of the US to block any sales to their NORAD partner, who is seeking to improve their capability regardless of whatever the perceived incremental increase. If anything, this would work against ongoing economic and political relationships. Why would you want that? In my opinion, successive Canadian Governments have bumbled their way through the process for the replacement for their CF-18s, and with their formal expression of interest for some or all of the RAAF FA-18s, they may have stumbled unwittingly into a get out of jail card. 5 continue the participation of both the RCAF and Canadian commercial partners in the F-35 development team – as they may still consider it as their preferred jet in the future. I am therefore led to believe that the long game for the Canadians is to position themselves to be able to select the F-35A in the future, after all the political ‘noise’ has abated, The RAAF purchase gives them (or a successive Canadian Government) that time for the noise to quieten down. Canada still needs to finalise their upgrades for the CF-18 to extend their life. Last year, “The DND estimates the cost of the modernization at between $250 million and $499 million, depending on the options chosen and what the government accepts, say defence sources”. In 2015, there was market talk about using a scaled down version of APG-79 on legacy Hornets, the APG-79(V)X radar. Has anyone heard anything new about the APG-79(V)X? What is the old Classic fleet and accessories worth? 300 Million Max I would have thought? Paul – why would it leave a capability gap on the RAAF? We would only be disposing of airframes deemed surplus to our requirements at the time. What I said about the US blocking the sale was done tongue in cheek, of course the US won’t block a sale. But in a way it would maybe force the Canadian politicians to pull their finger out and finally make a decision on a permanent fighter replacement happen sooner than later. This whole saga has been going on for well more than a decade, and purchasing some of our excess Classic Hornets just helps their politicians sit on their hands even longer too. I’m sure every Canadian politician must follow a motto: “Why do today, what you can put off until tomorrow or next year, or next decade, or never!”. Gary- please read my post a little more carefully. I said how many would Canada need to buy? How many do they require? and when do they need them by? We are receiving our first 35s in late 2018, so therefore my guess would be about 20 or more. So if they need them straight away, that would leave a gap. We wouldn’t be able to use those sold ones as spare parts for the classics we need to service if needed. Cheers. Canada is one of, if not THE most, respected countries in the world. They very rarely get involved in any meaningful way in other people’s wars, they view their entire multicultural society as Canadians and are respectful of their citizens. Ergo, no one gets p-d off with the Canadians so they have very little need for anything other than a protective role to repel the almost impossible chance of invasion. Hence, they don’t need a modern Air Force. One wonders if we get into a shooting war with North Korea will we be ruing having gotten rid of the F-111s??? Rocket why on earth would you want F-111s for? A Super Hornet supported by KC-30s and carrying Stand off Missiles has a greater effective range, a much smaller Radar signature and can defeat most fighters in Air to Air combat. The F-111 was a great aircraft in its day but so were the Mustangs, Phantoms, Spitfires and Mirages but those days are long gone. The F-111 would be a sitting duck today. Paul – rest assured that we will not be releasing Hornets to anyone until we a good and ready. This is good for the ADF as they should get good money for them, if not the Canadians who else would buy them? Finland is looking at Gripen NG, Kuwait is going for Supers, that leaves Malaysia,…maybe US would look at them for AMARC?? Unbelievable. Aircraft have a finite life and need replacement. Unless they’re waiting for mature F-35s to become available it’s just demoralising. No other country is offering stealth, excluding Russia and China. I’m expecting we’ll keep our 36 F-18Fs and still get 100 F-35As and form another 2 squadrons, long over due. I’d base them at RAAF East Sale AND Curtin too. Craig have you any idea how much it would cost to start up 2 new Fast Jet sqns, you have to buy the Aircraft, build the facilities, fund several 100 new personel positions including Aircrew, ground maintenence personal, Clerks, supply people, Medics, Cooks, build housing for these people, give them Uniforms, all the eqpt they need to do their jobs and train them and throw in free Medical and you want to do it on the remote coast of WA. Sorry mate but it will be either more F-35s or retain the Supers not both. What everyone needs to remember is that nearly all the time it is about sqns, Battalions, Regiments or Ship crews updating their equipment. Personal involved directly with the eqpt are the only ones that need to be retrained, no new positions have to be created, no new housing is req, Medical and Uniform costs are similar. It is a very rare event when the RAAF start up a new sqn from scratch, 2 sqn(Wedgetails) is the only one i can think of in recent times. Gary, what if they need them straight away? Their hornets are pretty long in the teeth. Secondly, they won’t be able to wait more than 2 years, that is my guess.. F-111? Rocket. As Mick has said it very well, the Rhino smashes it. Paul – would AMARC really want them? Don’t you think the USMC, considering they are in desperate need of spare parts ATM? The USMC has already raided the AMARC for F-18 spare parts… they would probably pay more for them too no? Craig – East sale? Why would we base F-35s there!? Amberley in QLD is much more warranted and is already on the cards if we get extra squadrons of F-35s. Plus Curtin is a bare base, not suitable for long term basing ATM, but surely will be used for intermittent flights when required. Mick – I hope we would retain the SHs, especially the Growlers which would compliment and enhance the F-35s capabilities as the NGJ is likely much more capable that the F-35s inbuilt EW suites, with a greater range, greater range in frequency jamming and able to target with greater intensity, as I understand it. The rest of the SHs should be upgraded as missile platforms, carrying up to 16 missiles a piece to back up the F-35s, which could link w/ them and guide their missiles long range. This is a much better option for the near to mid-term future force. Harry, I agree with you on the SH as they can carry much more than the 35. If Canada bought the latest blk111 Rhino coupled with the KC-30 and growlers, I think that would be a smart move. When the F-35 is mature and problem free they could always buy this down the track. The F-35 will be relevant and still ahead of its time for a long time to come if it is cracked up to be all they say it is. Craig, impossible! We are very lucky to be replacing a 1 for 1 jet. Most other countries are buying less. If anyone is going to invade us ( lets say China , we would lose our newly born extra 2 squadrons in a heartbeat. Leave Corey’s red cordial alone. Harry, yes agreed was actually thinking about the USMC but didn’t know they were so short on spares, so even better. Paul – from what I heard the USMC even raided a museum to get spare parts for the Legacy hornets! Craig, your right about NZ not starting up 1-2 fast jet sqns. On the other hand they would have plenty of money to do it. They could buy 20-36 Rhinos for a good price and have the RAAF to look after them and service, train and sustain. We have the infrastructure here , so they only have to cross some water. Cheers. Whatever the RNZAF does in that respect they would be silly not to leverage off the capabilities of the RAAF, and get some insight from Plan Jericho. Canada will pretend to have an open fighter tender, and choose the F-35. I bet you the Aussie hornets on it!! PAUL,they weren’t going to get it anyway! So if they adhere to that and it hasn’t been negotiated away during coalition negotiations, then it the possibility exists that the Air Combat Force Capability may return. @ ngatimozart You have to be joking. 1:1 replacement means current capability. Not years gone by. New Zealand’s fast jet capability was a token force so not really worth the expense or serious consideration to enhance fighter ops. They are better off investing in transport aircraft and SAR. Anti submarine is a waste of money for where they are. Aren’t we talking about Canada??? Craigy, they are better off investing in a capable fast jet force. They will have the Sings there to train with. Maybe buy the F-15 strike eagle to have the Sings to help them through.!! @ Craigy. I’ve just posted what was in their manifesto and if you look at the wording of my last sentence I used the term “the possibility exists” and “maybe”. It is something I won’t believe until I see it. Regarding the ASW aircraft. NZ has the fifth largest area of maritime responsibility in the world which extends from Antarctica to well into the tropics. The Air Surveillance Capability has the designation of a national strategic asset, and it’s far more than pure ASW. By the way to do get uninvited visits from foreign subs and the odd foreign ship in civilian guise manned by a naval crew cruising through our EEZ. ngatimozart, ok back to the subject , I don’t think our hornets can extend the Canadians hornets that much. They would be better holding the open fighter tender straight away.. This should of happened 8 years ago, and by now should of been transitioning to their new jet. Shame!!! @ngatimozart- Good info thanks, turns out the NZ Defence portfolio has been awarded to an NZ First MP who is Ex NZ Army, so will be interesting to watch & hopefully they will do the right thing for Transport & Orion replacement. @Craigy I once flew on a P3K Orion mission down to the Auckland islands, they also monitor Russian fishing vessels & otherwise operating off the coast, so important for Fisheries & Customs inc SAR. As for the token A4’s some are currently being used at Red Flag as electronically they are equal to F16 but cheaper to run, once all 22 were upgraded in the 90’s they were a potent strike asset, fully bombed up at Darwin next to RAAF Hornets & F111’s when East Timor kicked off, and the threats posed by Indonesia. Do you know how many F16’s & F18’s found there way into the gun sight of the RNZAF upgraded A4’s?. By the time the NZ Govt ever looks to recreate a strike wing it probably wont be 2nd hand RAAF Hornets, maybe Supers could be looked at? as F15 would be too costly to run. My pick if it ever happened, would see them go for new Single engine types such as F16/Gripen NG or F35, unless poor mans option is taken with F/A version of the Korean T50. Looks like the USMC should jump at the chance for legacy spares..
PAUL, I didn’t know that A-4s were bombed up next to ours. Thanks for that info. To have NZ fast jets working with us is fantastic. I would be pretty certain that NZ would choose either the Rhino or 16. Wouldn’t it be great if they did!! Here’s hoping. Cheers. @Paul: For sure – with current world events it would great to have a good combined ANZAC fast jet force again. We are so off topic! Rather than taking a gulp of red cordial and calling for a resurgent fast jet force for NZ, the Kiwi’s could think a little more outside of the box and stand up a light attack force with a squadron of Textron Wolverines. They already have the infrastructure supporting 11 earlier versions of the aircraft – the T-6C Texan IIs as trainers, so the transition would be very manageable. Its a niche not filled in Australia (moving away from Eurotigers?) and complements both the NZ and AU Army. The learning from recent joint expeditionary situations, seems to be that once air superiority is achieved, these craft supporting ground troops / SAS would be a more efficient use of air assets. So let the RAAF (ahem … USAF) deal with the Air Supremacy and team with RNAF Wolverines to provide the strategic support of soldiers calling in surgical strikes on the ground. It would allow the NZAF to really excel at a unique and demanding offering, that specifically complements their own and coalition troops. Anyway – back to reality. My thinking would have the Kiwis look to upgrading their P-3s to P-8s, not fast jets. Philip, I tried to change the topic back to Canada but with little success. No fast jet force? . That could be a topic for another day. Canada, Please at least buy or lease the latest blk111 Rhino or even the F-15 E. Then when the F-35 is problem free hopefully, transition too them. Cheers.